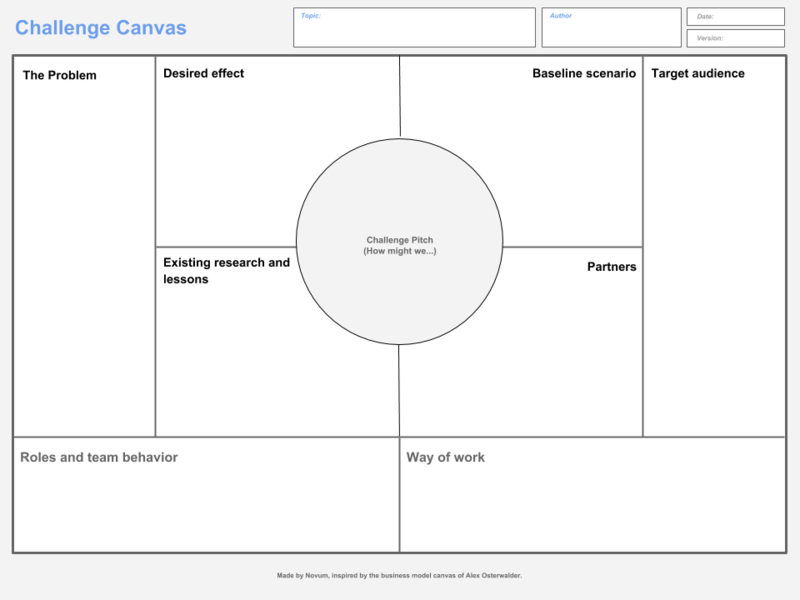 This blog post is about the challenge canvas and why it is a useful tool when you are starting an innovative project. TLDR: because defining a good challenge before you start a project is very hard. At Novum, the innovation lab of the Dutch Sociale Verzekeringsbank (SVB), we try to enhance the standard of living of our citizens by making use of innovative ways of working and new technology. In aiming to do so we combine Design Thinking, Lean Startup and Agile techniques to help solve problems experienced by our clients. In the two years of our existence, and after many lessons learned, we realized that finding and creating innovative solutions is not the hardest part of our work. Instead, our toughest challenges lie in finding the right definitions of problems to be solved. A good challenge should be clear and specific, addressing an actual problem that can likely be solved in an innovative way. With a challenge formulated like this it is very tempting to get all excited as innovator. The question is, if this is rightly so…? Let’s examine the challenge more closely, and find out why we feel it is a bad start for innovation. As you see, asking the why question will give us far more insight into what the actual problem is that needs to be solved. If the real problem, in this case, was the high amount of rework and cost, the new challenge becomes “Could the high amount of rework and costs in the application process of service Z be reduced using AI?”. Taking an approach like this will provide a way larger playing field to innovate and much more room for exploring different possible solutions. As a result, the real change the manager or client wants to achieve becomes much clearer, and measurable goals become much easier to define. Now, when reading the challenge sentence again more closely, you might notice that it was formulated in a closed (“yes” or “no”) way: “Could you do this or that…?”. The challenge is questioning your capability in a way that does NOT invite you to immediately define a solution. It is much easier to come up with clear challenges when they are formulated in an open-ended way, and the best way to do that is with the words “how might we…?”. This part of the sentence seems harmless but in fact, it is not. What putting it like this does, is implying form X should be part of the solution, thus already making an implicit design choice, even before the innovation process has started. You don’t want to be cutting of the many more exciting and innovative avenues there are to explore. Why should it be a given that the customer uses a form to apply for service Z? Who knows, he could just as well be using Alexa or Google voice? This is the part of the sentence that seems to give the challenge it’s innovation street credit. “Why is this an innovative project?” “Well, because we will use A.I.”… One might as well be putting a layer of frosting over a plate of spaghetti and declare it is a cake! Why? Well… it has frosting, doesn’t it? This is why it is so crucial to keep asking your client/ manager why he/ she insists on using A.I. In many cases, the answer will be that the client/manager sees this project as an opportunity to learn something about new technologies. If this is the case it is a good idea to make the learning part of the project explicit. As organization X we want to apply technology Y to process Z so we can learn if this a technology worth further research and investments. Here, we fill in the description of the problem that needs to be solved. Problems get formulated through dialog within the team, with the client/manager and with customers. What we found is that the best way to define a problem is by asking the “why?”-question over and over again. When approached in that way, the real core of the problem gets more and more clear, and will fully reveal itself in the end! In this field we describe what the desired measurable effects are that the proposed solution must be able to deliver. Please also note that effect and output of the solution are not necessarily the same thing. For example, a reduction in the number of errors in an application process may be regarded as the output, while an increase in customer satisfaction would be the desired effect of the innovation process. Being able to give a description of the desired effect in the future, one should also be able to give a description of the current situation and how it will likely evolve if nothing is done about it. This is what we call the Baseline scenario. Defining this is important because it will enable proper measuring of the success and attribution of a project after it’s finished. Trying to find these numbers in retrospect at the end of a project is not something you want to have to be doing. For example, in describing the current customer satisfaction score and the trend it is expected to follow, it may also be a good idea to take into account the efforts that are being made by other projects that are working on customer satisfaction. This is to fill in a list of Partners that could be of help, or that are needed to solve the problem. These could be academics, industry liaisons, start-ups, and/ or government institutions. Making this list is crucial because as innovators it is only too easy to get caught up in our own projects and to forget to ask for help and aim for co-creation with obvious partners. As it is very unlikely that your team is the first ever to try and solve a problem, compiling a list of available research related to that problem is essential. Digging around in your organization and finding the lessons learned from earlier projects is always a good way to go. Starting your project with insight into what is already known and what is still left to investigate will likely give you a good head start. It is our conviction that innovation can only be successful in the context of a great team. As the make-up and behavior of the team can make a big impact on the end result, it is of the essence to properly define the roles that are needed in the team and to also describe a shared view of how the team should behave and interact to be successful. This part of the canvas should not be used to write down a big plan. It is meant for making a list, and in what order, of the innovation methodologies we want to apply when solving the problem. How should the Challenge Canvas be used? Well, obviously, the canvas is meant to be used at the beginning of a project. But using it along the way, for updates and rewrites, when during the project new insights may have occurred that changed the original scope of it, may also prove to be a good idea. At Novum, we are not too scrupulous about starting a project if the canvas is not completely filled out yet. In those cases we just let it serve as a reminder that some parts in the project are still underdefined, and will probably need attention and research later on in the project. The canvas can freely be downloaded from our website and used or altered as you please. We would really like to hear from you and learn from your experiences with it, so we can keep improving it. Don’t hesitate to drop us a line at info@novum.nu or connect with us on Twitter:@novum_nu!